A*STAR researchers have created synthetic molecules to treat fungal keratitis – an infection of the cornea that causes visual disability. The new molecules are a first step toward developing effective drugs to combat this widespread disease. According to the World Health Organization, corneal ulcers resulting from keratitis cause 1.5–2 million people to lose vision in one eye each year, with fungal infections accounting for nearly half of keratitis cases caused by microbes. "There are no safe and effective antifungal agents for clinical treatment of fungal keratitis," says Jackie Ying, the executive director of the A*STAR Institute of Bioengineering and Nanotechnology (IBN), Singapore. Ying and IBN group leader Yi Yan Yang led a team of researchers who developed a series of short, synthetic protein fragments designed to mimic antimicrobial peptides produced by the immune system. The synthetic peptides were broadly effective against bacteria and Candida albicans, one of the pathogens that can cause fungal keratitis. However, they had not been tested against fungal keratitis, where C. albicans aggregate to form a biofilm that protects the fungus. The team evaluated three synthetic peptides to determine which structural characteristics were effective against fungal keratitis. All three peptides were designed around a core spiral structure known as an alpha helix, but each was slightly different. The first peptide was a short, simple helix, the second was a helix capped with the amino acid cysteine, and the third was a longer helix. 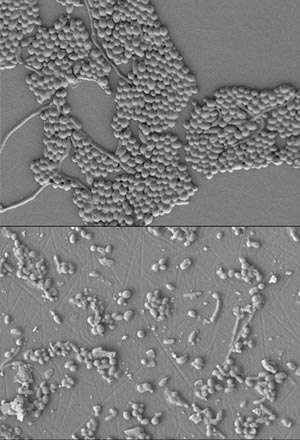 While all three peptides slowed the growth of C. albicans, the simple helix had little effect when tested against fungal biofilms. Both the other peptides were able to disrupt the biofilm and eradicate 90 per cent of the fungus within 24 hours, with the longer peptide being effective at lower doses. Both peptides also relieved keratitis symptoms in mice infected with C. albicans. "We were excited when we saw that, since we may have discovered a solution to treat severe fungal keratitis," says Yang. The peptides are a first step toward developing antifungal agents to treat the disease. Overall, the two peptides performed as well as the antifungal drug amphotericin but with promise to overcome some of its drawbacks, such as its high cost and limited clinical applicability due to low solubility and instability. Next, the team will move to trials in rabbits, testing the best-performing candidates from this and other studies to confirm their activity and evaluate their safety.